If you want to straighten your teeth or correct a bite problem, you have more orthodontic options in Valrico than ever before. The current menu of orthodontic treatments requires a whole new glossary. Here are some of the common orthodontia terms heard around Valrico cosmetic dentistry offices. These are sometimes described as ‘braces behind the teeth’. These braces are just as effective at realigning adult teeth as the traditional ‘metal and wires’ kind but are almost completely hidden. Many Valrico adults and teens who straighten their teeth choose this type of orthodontia. Invisible braces work great for many Valrico braces patients. To find out if lingual braces are the best type for your teeth, lifestyle and budget, schedule an orthodontic consultation at Five Star Dental Care by calling 813-653-2273. We can help you determine which type of adults braces system is right for you and your smile. We offer Invisalign invisible braces. Once a Valrico clear braces or traditional braces patient has completed treatment, retainers must be worn regularly to keep the beautiful straight teeth in their corrected position. There are several types of retainers available for Valrico cosmetic dental patients. The time-tested Hawley retainer consists of a metal wire that surrounds the teeth and keeps them from shifting. The metal wire is attached to a molded acrylic form that fits snugly in the upper mouth (palate) or lower mouth. Clear retainers are newer on the Valrico orthodontic scene. They cover the teeth like a see-through glove and do not need metal bows or clasps. 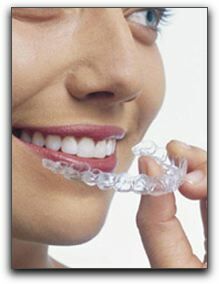 Some Valrico retainer wearers believe clear retainers are more comfortable than Hawley retainers. You don’t need to suffer with a mouth full of metal to get the beautiful teeth you are seeking. Let us help you develop a custom treatment plan for your smile. Call our office to speak with Invisalign dentist Dr. Jeff Bynum. This entry was posted on Friday, July 29th, 2011 at 9:49 pm	and is filed under Invisalign. You can follow any responses to this entry through the RSS 2.0 feed. Both comments and pings are currently closed.